So I saw Age of Ultron not too long ago, and I did a post about it. 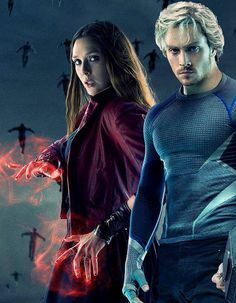 But I did not make mention of two of the most intriguing characters in the film: twins Pietro and Wanda Maximoff, better known in some circles as Quicksilver and the Scarlet Witch. When was I going to get to the Maximoff twins? Well, now seems to be as good a time as any! With everything else going on in the film, Whedon did not have a lot of time to squeeze Pietro and Wanda Maximoff into the story in such a way that everyone in the audience would get to know and like them on the spot. For those of us who did enjoy the characters, or who knew something about them from days past (X-Men reference! ;)), we saw, we knew, and we liked plenty! But what we do see of Quicksilver is very in-character. As shown in the movie, Pietro moves so fast that to him, bullets appear to be moving in slow motion. The nine millimeter bullet most commonly used and mentioned in TV shows and films travels at 1200 feet per second. That means this type of nine millimeter bullet will literally beat your hand to the door knob when you are standing next to the door and the person holding the gun is across the room. But even this lightweight bullet is not faster than Quicksilver. Because he is so much faster than everyone and everything around him, Pietro has an impatient outlook on life. As an example, Pietro can race across town in a few seconds flat. Then he will have to wait fifteen or more minutes for the bus/train/tram/whatever Wanda is riding to catch up with him. Now think about how hard it is for his opponents, who cannot see him to shoot him, to do battle of any kind with him. He is literally as fast, if not faster, than the wind. Put this all together and you have a kid with a cocky battle attitude wreathed with the impatience of a lightning bolt. He can be up, out, and gone in seconds. Why can no one else just keep up? His impatience is spot on. Wanda’s powers are also well rendered in the film. In the comics, her original power is probability manipulation. The probability of a new, well-built wall collapsing is something she can make happen with a little concentration and a gesture. Another post on this blog (which is frequently being read! ), The Art of Probability Manipulation, goes into detail about the comic book Scarlet Witch. In Age of Ultron, Wanda’s powers are described as telekinesis, hypnosis, and energy manipulation. In the film, she can telekinetically move or break things, and her hypnotic powers mean that she can make those she entrances see their worst fears or memories. She is telepathic/ empathetic, rendering her able to read the minds and emotions of those around her on some level. She can then use that reading to send those people into a trance, where they are temporarily trapped in a nightmare of their own fears/pasts, which she is privy to as well. The twins’ strong sibling relationship is also well-demonstrated in the movie. Throughout the film, Pietro can be seen snatching Wanda up and running off with her in his arms. In the final battle, he does this to get her to the center of the city where she can use her powers most effectively. This is a tactic the two have been seen to utilize in the cartoons and probably in the comics as well. The fact that they do not separate from each other until Wanda orders her older brother to help Cap and the others round up the last of the civilians and get them to safety is also true to form. The twins hardly ever separated from each other for any great length of time when they first arrived in the comics. Outside of recent TV shows like X-Men: Evolution and Wolverine and the X-Men, it is shown that the “brother-sister act” have always been close, as most twins are. It was nice to see them acting like they did toward each other in the original comics in this film. As has been explained elsewhere, the Maximoff twins blame Tony Stark for the death of their parents. Because they hate Tony, the twins hate the Avengers, something made blatantly clear throughout the first half of the film. But once Wanda sees what Ultron really intends to do, the twins abandon him. Interestingly, before that happens, Wanda frees Dr. Helen Cho from Ultron’s control via the “glow stick of destiny” while in her lab where he is downloading himself into a new body. This proves that she does not simply want to run away from Ultron, she wants to stop him. But it is only when it becomes clear that the Avengers need help to stop Ultron that Wanda truly chooses to get into the fight. Pietro naturally follows her into the battle, the way she followed him into their first skirmish with the Avengers at Strucker’s HYDRA base. (Again, this is in-character with their depiction in the comics; when one twin makes a choice the other follows him/her.) Once Cap assumes their help in stopping an out-of-control train in South Korea, making no mention or fuss of any kind about their previous allegiance to the mad robot, the twins come to see that they may have been wrong about the Avengers after all. We do not know how the twins feel about everyone on the team, but it appears that Wanda warms up to Cap very quickly after helping him out in South Korea. This would be a nod back to the original comics as well; Wanda was fond of Cap from the moment she met him. In those comics, Hawkeye occasionally asked her if she had a crush on Cap, but Wanda never gave anyone a direct answer on that front. Another Avenger Wanda takes to fairly quickly in the movie is Hawkeye. 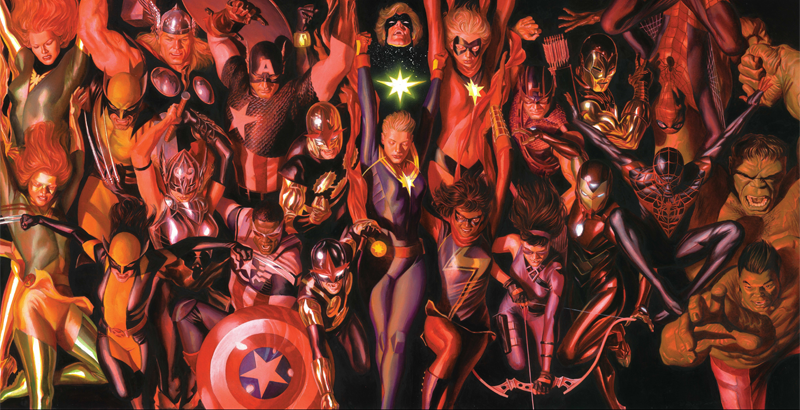 In the “mainstream” comics, Hawkeye is roughly the same age as the twins, and they all joined the team at almost the same time. Hawkeye thought Wanda was gorgeous the minute he saw her and immediately tried to court her. But this did not pan out and he eventually settled for being one of her good friends instead. That failed romance, though, is certainly not part of Age of Ultron. (Yay!) However their quick, strong friendship in this film is itself fairly surprising. Especially since Clint stuck an electrical stun arrow to her forehead to keep her from putting him in a trance earlier in the movie. Though Clint clearly does not like her when he meets her again in Avengers Tower, in Nova Grad this changes dramatically. In the final battle, Wanda and Clint end up in the same street, fighting several dozen Ultroids as a team. When one of the droids prepares to explode, Hawkeye grabs Wanda and dives into the nearest building, getting them out of the way of the machine as it blows up and keeping them safe. 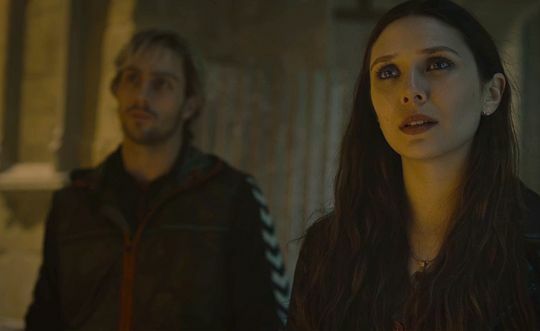 Wanda starts to become hysterical as the magnitude of what Ultron is doing – what she and her brother helped him to do, and the fact that she is in part responsible for his creation – comes crashing down on her like a ton of bricks. This is not what Hawkeye needs to deal with at the moment, and he does not spare Wanda, giving her one of the best pep talks I have ever heard. Sometime after this, Wanda helps him out of a tight spot and the two destroy a group of Ultroids very quickly. Throughout the rest of the battle they not only continue their new teamwork dynamic; they begin working in better harmony with each other. Later, when Wanda declares that she will guard the machine bringing half of Sokovia’s capital city skyward, Clint looks at her in surprise. “It’s my job,” she says, looking back at him. This is a reference to their earlier “chat,” where he told her that it was his “job” to help save the world – no matter how insane the situation became. By the end of the film, the two clearly have a good appreciation for each other. I will be interested in seeing where they go from here – though I am hoping the direction is a non-romantic one! On the subject of Hawkeye’s relationship to the twins, while he and Wanda gain a mutual respect and understanding, it is a little different between him and Pietro. This is reasonable, since Quicksilver introduces himself to the archer by punching him at high speed and sending him flying. When Hawkeye prepares to fire an arrow after him, he is nicked by a shot from a HYDRA bunker and ends up having a lousy day. This is not a good way to start a friendship. And it only gets worse when Hawkeye sticks his stun arrow to Wanda’s forehead to avoid getting mind controlled. While the Hawk is not in the habit of picking on women or girls, as he explains he is “not a fan” of mind manipulation, and he will do whatever he can to avoid having it happen to him again. 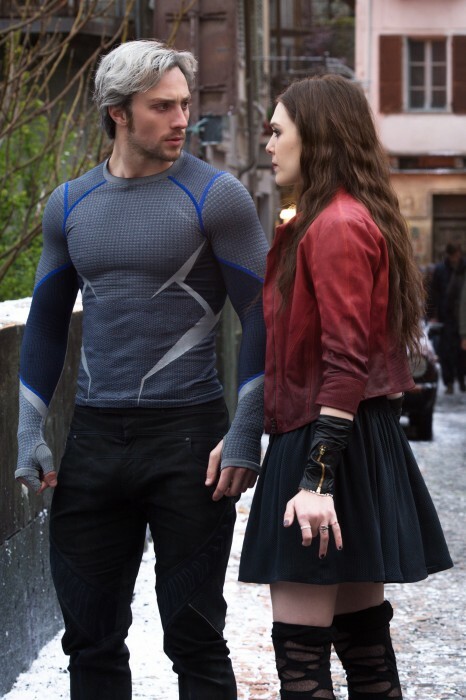 Pietro takes high offense whenever Wanda is hurt and is prone to angrily attack whoever harms his sister. He and the archer become rivals, and their enmity is based in part on their confidence in themselves. Hawkeye is confident in his shooting skills and his accuracy, while Pietro is secure in his speed. This would naturally lead to contention between the two, even if they started out as friends; they have often butted heads in the “mainstream” comics for this reason. But there is another layer to the antagonism they direct at each other in the film. Hawkeye is not Pietro’s age, so his end of the challenge is not layered with that mindless, “I’m going to beat you because you beat me” juvenility. Pietro has power but little experience and skill. As Hawkeye says, he is a “punk.” His speed is a “big stick,” but he overuses and relies on it to get what he wants. Their rivalry is instead edged with the antagonism some youths feel toward those with more experience; Quicksilver thinks his power makes him unstoppable. Hawkeye is confident in his skills, but he is not foolish enough to believe they make him utterly impervious to harm. He has experience getting hurt in a battle. 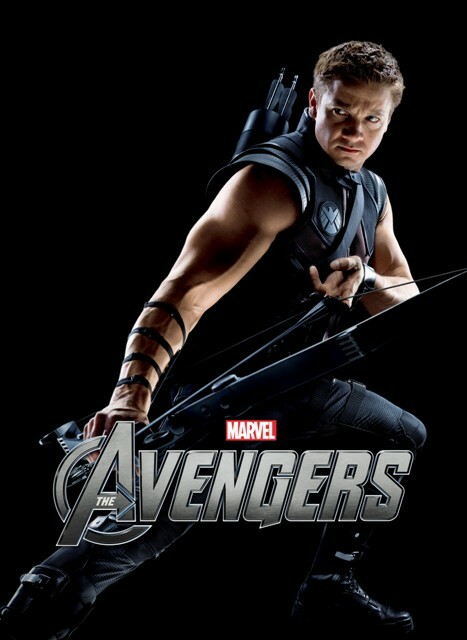 Pietro gets the message, loud and clear; Hawkeye is not useless because he uses a bow and arrow. And he (Pietro) had better realize that power does not make someone immune to all the unavoidable risks and fortunes of battle ‘normal’ mortals are subject to. Hawkeye seriously considers shooting the boy for this jibe. But in the end, he knows it will not work and puts his arrow away, muttering angrily. In my opinion, that was the closest he was going to come at the time to admitting that he thought Pietro was okay. The kid was annoying, but he had good in him. Pietro proves how much good he has in him at the end of the battle. When Hawkeye goes back to pick up a Sokovian boy who got left behind, Ultron, flying the Aveng-jet, strafes the ground in a straight line toward him. Clint knows there is no time for him to move out of the way. He is tired, he has a child in his arms, and the air is getting thinner by the minute. The jet is coming toward him far too fast for him to get out of the way in time. Though it will do nothing, he does his best to shield the unconscious boy and waits for the bullets to hit them both. Pietro sees the jet. He sees that his rival is doing his best to protect a little boy, and that there will be no protection from the incoming bullets. It takes him a split second to make his decision. He will die. Wanda will be left alone in the world. But his power was not meant to serve himself. It was meant to serve his people. And Hawkeye, his rival, is doing his best to protect a Sokovian boy. Blindingly fast, he covers the necessary distance and shoves Hawkeye and the boy he is protecting out of the line of fire of the jet’s mini-gun. To make the shove safe, Pietro had to have slowed down so that he did not hit Hawkeye at his highest velocity. When Quicksilver runs at his higher or highest speed, he builds up force and momentum which he can use against his opponents. This is why he is able to send Hawkeye and Cap flying, and why he can smash the Ultroids to pieces. The force he collects as he runs is sent outward toward his target when he hits it. So Quicksilver shoving Hawkeye out of the mini-gun’s path at a dead run would have injured or killed Clint, and possibly the boy he was protecting. Plus, as fast as he is, if Quicksilver runs into the path of a bullet, he is going to get hit. 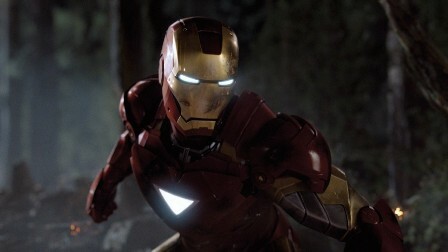 And his suit in this film is not designed to protect him from being shot or injured but to let him run as fast as he wants. Those conditions – combined with his need to stop in order to safely push Hawkeye out of the way – mean that he is the one shot and killed by Ultron. Hawkeye is nicked (again) but this time, Pietro was saving his life and a young boy’s. He was doing his utmost to help them both, not to hurt them. I thought it was a really nice scene, since in it, Pietro proves he is more than a “punk.” He is a hero. Hawkeye realizes this at once. Kind of hard not to when Pietro’s last breath was used to say, “You didn’t see that coming?” He buried his hatchet right there. So did Hawkeye. Having Cap carry Pietro to the waiting SHIELD shuttle was good, too. If Captain America shows such respect to a young, brash hero like Quicksilver, it is a sign that he thinks the kid is well worth the admiration. And having Hawkeye name his newborn son Nathaniel Pietro Barton was a real stroke of genius on Whedon’s part. Despite the sadness of the scene, I still think it was a good one, in the same way that Kíli’s death in The Battle of the Five Armies was a good death. Pietro did well in Age of Ultron, and I have always thought he was an intriguing character. Perpetually impulsive, abrasive, and impatient, but intriguing nonetheless. I wish Quicksilver had lived through the film to be in later Avengers installments, but Whedon did not give him an ignominious send-off. He treated Pietro like a hero, and I tip my hat to him for that. However, the alternate ending for the film shows both twins, alive and well, as they join the new Avengers under Cap and Widow’s tutelage. From what I have heard, Whedon made this ending as insurance; this way, if Disney did not want Quicksilver to die, he had a ready-made finale to Ultron which they would hopefully support. Disney approved Pietro’s death, obviously, and I can think of two reasons why Whedon chose to “get rid of” Pietro Maximoff at the end of the movie we saw in theaters. Whedon likes to reverse stereotypes and clichés, or completely turn them on their heads. He has to have read the Ultimate comics, because a lot of small things in the Avengers films relate to those comics: Samuel L. Jackson’s Nick Fury; Iron Man’s attitude and the revelation of his identity to the world; Hawkeye’s suit and family, not to mention the twins’ initial allegiance to evil in Age of Ultron (Magneto had them working for him in the Ultimate comics before he was killed and they joined the Ultimates). So Whedon had to know about Wanda’s death in those comics. And as I said, he likes to do the unexpected in these cases. Instead of killing off Wanda, as all those Marvel fans who have read the Ultimates’ stories expected he would, he knocked off Quicksilver. Second: Aaron Taylor-Johnson, the actor who plays Pietro Maximoff in the film, was very worried about signing on to play the character. He cited the fact that Marvel often has actors sign a contract to play a character in a series of movies instead of doing a one-and-done deal as the reason for his trepidation. Marvel’s modus operandi in this area is well established fact, as Chris Evans’ original contract still includes Avengers: Infinity War, Part 1 and 2. Sebastian Stan and Samuel L. Jackson are/were each contracted for nine films; Jackson recently had Marvel extend his contract so he can be in more Marvel movies. Hugo Weaving still has two more movies in his contract with Marvel, and Jeremy Renner was contracted for seven films, including a solo Hawkeye movie (which is still in writing limbo). Chris Hemsworth has three more movies in his contract and has stated that he would be quite happy to continue making Marvel movies for as long as he is physically able and as long as fans want more. (Bad thing to say, because when are we going to stop wanting more? 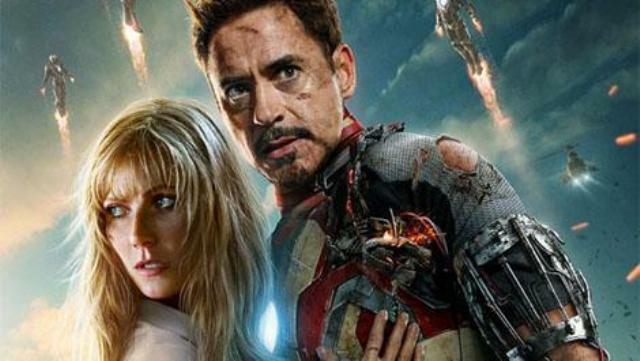 We will always want more Marvel movies – as long as they are THIS good!) 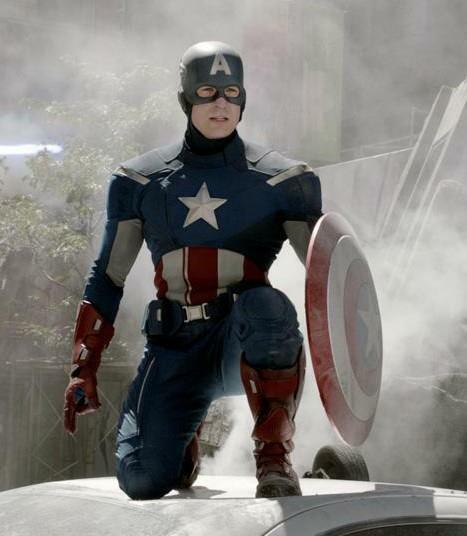 And Chris Evans recently extended his contract with Marvel so that he can be in five more films! 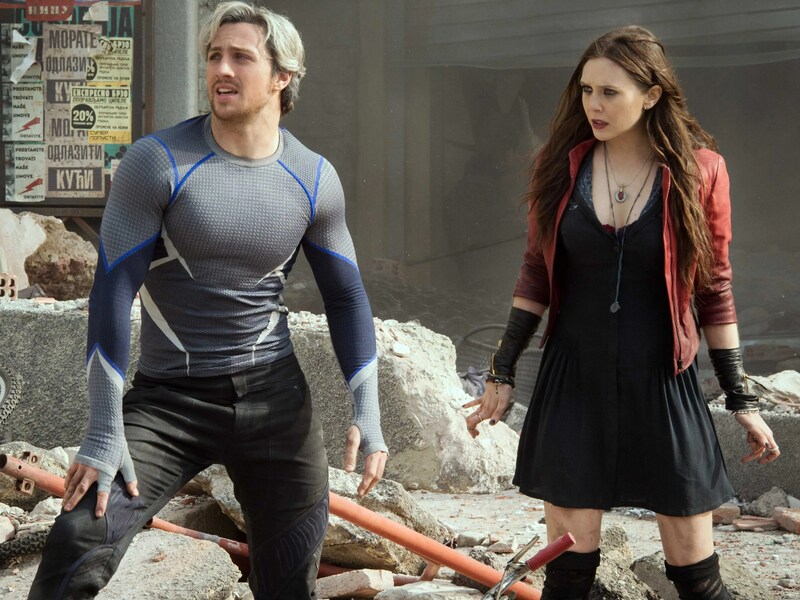 The only reason Aaron Taylor-Johnson signed on to play Pietro Maximoff in Age of Ultron was because Elizabeth Olsen signed up to play the Scarlet Witch. When she heard Johnson was worried about taking the part, she convinced him to be in the film. On her coaxing he did sign up. This is because, after they worked together on the latest Godzilla remake, he trusted her decision. I do not know how many Marvel movies Johnson agreed to be in. As far as I know, he only agreed to Age of Ultron and would not sign up to be in more than one Marvel movie (at a time, anyway). So Whedon may have killed Quicksilver off in order that Johnson would have an easier way of getting out of his Marvel gig. 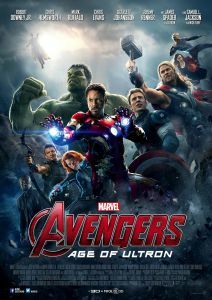 Essentially, if Johnson did not want to be in Marvel’s Avengers films, Whedon knew he could fix the actor’s dilemma simply by killing off his character. 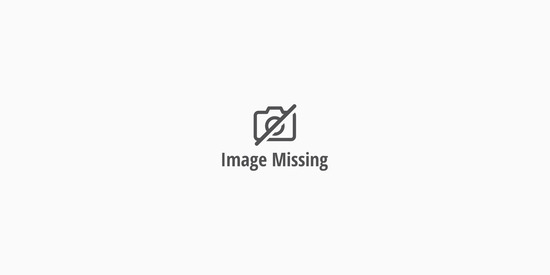 These are theories I have about why Pietro Maximoff does not survive Age of Ultron. I could be blowing smoke, of course, but they are the only theories I have which make any sense. As a final note, I really enjoyed having the twins in the film. Johnson and Olsen did well as the Maximoff siblings and it is too bad Johnson did not sign on to be in more films. This does not mean that Marvel may not bring Pietro back into the Avengers movies somehow. It just means that we will have to wait and see what happens. Anyone want to play tiddly winks while we wait? This entry was posted in Marvel Comics' Characters and Stories, Movie Reviews and tagged "mainstream" Marvel Universe, Aaron Taylor-Johnson, Avengers, Avengers: Age of Ultron, Black Widow/Natasha Romanoff, Captain America/Steve Rogers, Chris Evans, Chris Hemsworth, Death, Dr. Strange, Elizabeth Olsen, energy manipulation, Hawkeye's family, Hawkeye/Clint Barton, heroic death, Hulk/Bruce Banner, HYDRA, Iron Man/Tony Stark, James Spader, Jeremy Renner, Joss Whedon, magic, Mark Ruffalo, Marvel, Marvel Cinematic Universe, Marvel Comics' Characters and Stories, Marvel films, Marvel movies, probability, Quicksilver/Pietro Maximoff, Robert Downey Jr., Scarlet Witch/Wanda Maximoff, Scarlett Johansson, SHIELD, telekinesis, The Scarlet Witch, Thor Odinson, Ultimate Marvel Comics, ultron, X-Men on October 20, 2015 by The Mithril Guardian.